The CEO of EA says he will cancel the remaining Madden Classic qualifier events after two people were fatally shot and 10 others injured at a “Madden NFL 19” tournament in Jacksonville, Florida. 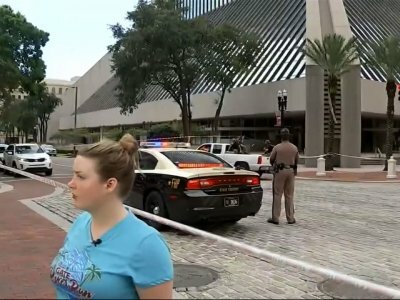 The suspect in a deadly shooting at a Florida video game tournament had previously been hospitalized for mental illness. That’s according to court records in his home state of Maryland reviewed by The Associated Press. Katz killed two people and wounded nine others before fatally shooting himself at the “Madden NFL 19” tournament in Jacksonville, authorities said. Florida’s candidates for governor are sparring over guns after a mass shooting at a video game tournament in Jacksonville. She said they were “afraid” to answer questions about their strong support for gun rights and the National Rifle Association. The Jacksonville Sheriff’s Office identified the victims Monday as 22-year-old Elijah Clayton of Woodland Hills, California, and 28-year-old Taylor Robertson of Giles, West Virginia. Sheriff Mike Williams said 24-year-old David Katz of Baltimore specifically targeted fellow gamers attending the tournament before killing himself. Katz’s motive remains unknown. Authorities say Katz killed two people and wounded 10 others before fatally shooting himself Sunday at the “Madden NFL 19” tournament being held at a riverfront mall. They say one person was treated for a “non-gunshot-related” injury. Officials haven’t released a motive for the shooting. The records show Katz’s parents disagreed deeply on how to care for their troubled son. Katz’s father claimed his estranged wife was exaggerating symptoms of mental illness as part of the couple’s long-running and acrimonious custody battle. They divorced in 2007. Authorities say Katz killed two people and wounded nine others Sunday before fatally shooting himself at the “Madden NFL 19” tournament in Jacksonville. A gaming rival of the man blamed for a deadly shooting rampage at a video game tournament says he’s baffled that anyone he had competed against online would resort to bloodshed. Shay Kivlen of Seattle traveled to Jacksonville, Florida, for the weekend “Madden NFL 19” tournament. He was resting at his hotel Sunday when authorities say a gunman killed two people at the venue and wounded nine others before fatally shooting himself. Authorities identified the shooter as David Katz of Baltimore. Kivlen said he’s heard plenty of rumors. A friend told him that he’d heard Katz was asking about Kivlen before the shootings. Shay Kivlen was the best friend of one of the gamers who was killed in Sunday’s shooting at Jacksonville Landing in Florida. Kivlen tells The Associated Press that 24-year-old David Katz didn’t talk much with fellow gamers, either online or when they met face-to-face for Madden tournaments. He says much of what he and others knew of Katz, they learned from his baffling style of playing the game. A previous version of this report had an incorrect spelling of Shay Kivlen’s name.